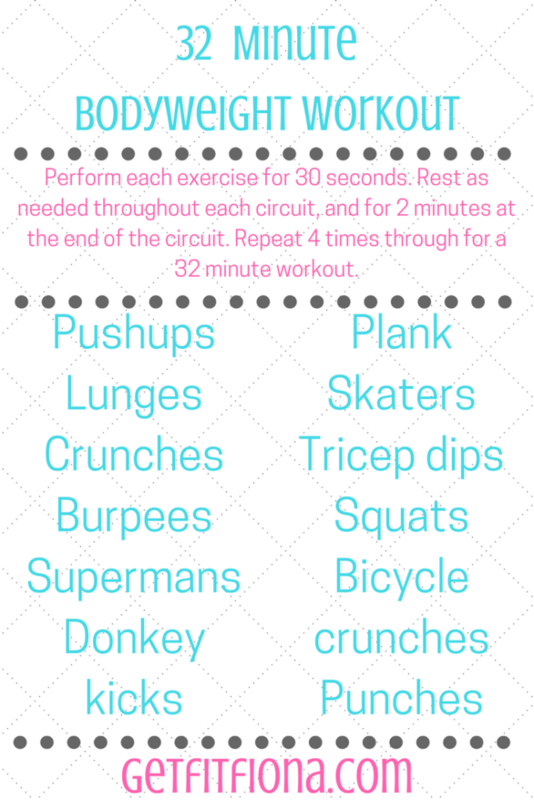 Today I’m sharing a 32 minute bodyweight workout that doesn’t require any special equipment. It’s perfect for when you can’t get to the gym or you’re traveling. This workout is pretty straight forward. Perform each of the exercises listed below for 30 seconds before moving onto the next one. Once you’ve completed each exercise one, rest for 2 minutes. (If you need rest before that, of course rest as needed. It’s more important to rest and use correct form that plow through with bad form and potentially get injured.) Repeat 4 times total for a total of 32 minutes. Below you’ll find a description of each exercise in case you’re unfamiliar with any of them. Planks // The plank is very similar to the starting position of a pushup. Your hands are slightly wider than shoulder width, and your body is a straight line from your head, through your shoulders, hips, and knees, to your heels. Just like with the pushup, if you need an easier modification, use your knees instead of your toes. For more workouts, check out my workouts page. As always, check with your doctor before working out. Honor your body and modify this workout for your injuries and limitations.